Functional Requirements for Bibliographic Records (FRBR /ˈfɜːrbər/) is a conceptual entity–relationship model developed by the International Federation of Library Associations and Institutions (IFLA) that relates user tasks of retrieval and access in online library catalogues and bibliographic databases from a user’s perspective. It represents a more holistic approach to retrieval and access as the relationships between the entities provide links to navigate through the hierarchy of relationships. The model is significant because it is separate from specific cataloguing standards such as Anglo-American Cataloguing Rules (AACR) or International Standard Bibliographic Description (ISBD). The ways that people can use FRBR data have been defined as follows: to find entities in a search, to identify an entity as being the correct one, to select an entity that suits the user's needs, or to obtain an entity (physical access or licensing). Descriptive relationships exist between a bibliographic entity and a description, criticism, evaluation, or review of that entity, such as between a work and a book review describing it. Descriptive relationships also includes annotated editions, casebooks, commentaries, and critiques of an existing work. ^ a b c d "Functional Requirements for Bibliographic Records - Final Report - Part 1". ifla.org. Retrieved 15 April 2014. ^ Renear, Allen H.; Choi, Yunseon (10 October 2007). "Modeling Our Understanding, Understanding Our Models - The Case of Inheritance in FRBR". Proceedings of the American Society for Information Science and Technology. 43 (1): 1–16. doi:10.1002/meet.14504301179. ^ Floyd, Ingbert (2009). "Multiple interpretations: Implications of FRBR as a boundary object". Proceedings of the American Society for Information Science and Technology. 46 (1): 1–8. doi:10.1002/meet.2009.14504603110. ^ Tillett, Barbara. "What is FRBR?" (PDF). Library of Congress. Retrieved 5 August 2017. ^ "Functional Requirements for Bibliographic Records - Final Report - Part 2". ifla.org. Retrieved 15 April 2014. ^ International Federation of Library Associations and Institutions. "Functional Requirements for Bibliographic Records: Final Report". Retrieved 3 December 2013. Madison, Olivia M.A. (July 2000). "The IFLA Functional Requirements for Bibliographic Records: International Standards for Universal Bibliographic Control". Library Resources and Technical Services. 3. 44 (3): 153–159. doi:10.5860/lrts.44n3.153. Retrieved 16 February 2013. A data model is an abstract model that organizes elements of data and standardizes how they relate to one another and to properties of the real world entities. For instance, a data model may specify that the data element representing a car be composed of a number of other elements which, in turn, represent the color and size of the car and define its owner. Anglo-American Cataloguing Rules (AACR) were an international library cataloging standard. First published in 1967 and edited by C. Sumner Spalding, a second edition (AACR2) edited by Michael Gorman and Paul W. Winkler was issued in 1978, with subsequent revisions (AACR2R) appearing in 1988 and 1998; all updates ceased in 2005. In library and information science, cataloging is the process of creating metadata representing information resources, such as books, sound recordings, moving images, etc. 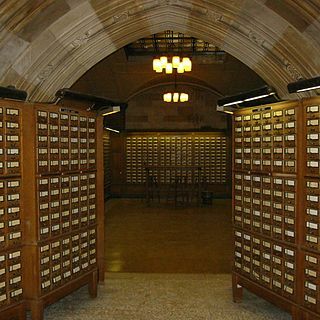 Cataloging provides information such as creator names, titles, and subject terms that describe resources, typically through the creation of bibliographic records. The records serve as surrogates for the stored information resources. Since the 1970s these metadata are in machine-readable form and are indexed by information retrieval tools, such as bibliographic databases or search engines. While typically the cataloging process results in the production of library catalogs, it also produces other types of discovery tools for documents and collections. VTLS Inc. was a global company that provided library automation software and services to a diverse customer base of more than 1900 libraries in 44 countries. The for-profit company was founded in 1985 by Dr. Vinod Chachra, who became the President and CEO of the company. VTLS originated as "Virginia Tech Library Systems", an automated circulation and cataloging system created for Virginia Tech’s Newman Library in 1975. In addition to its headquarters in Blacksburg, Virginia, United States, VTLS had five international offices in Australia, Brazil, India, Malaysia and Spain. VTLS was one of the few ISO 9001:2008 quality-certified companies within the library industry for many years. The company was acquired by Innovative Interfaces in 2014.